I just thought I'd share this photo with you lovely people on the web. 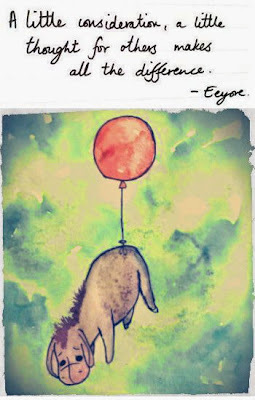 I find it so uplifting, (get it haha) as this Winnie the Pooh-Eyore quote describes how simply being open and friendly towards others creates an altogether an almost immediate understanding and friendly connection for the both of you. This I feel is very important when talking to others. I think this picture also refers to general everyday gestures like a quick, sunny smile to passers-by or taking that time out of your busy lifestyle to spend a little while with anyone you may know who is feeling a little under the weather and could do with some cheerful company. More often than not, each person you meet will be dealing with some form of pain in their lives whether emotional/mental/physical etc, so just that one person on the street showing a random act of kindness could make all the difference to their day by showing them a little warmth from within. So I suppose really, I'm just emphasising the fact that we should all make more of an effort to treat others well, I include myself in this as nobody is perfect or makes the right decision with every thought, but what danger could a little smile bring to the world? A severe case of upbeat, happy people from all over the globe caring for one another's needs? It's about time we make this contagious, so please feel free to smile at anybody you see as we pass this infectious grin around the Earth.